About Lighthouse Point real estate: Known best for its slow-paced atmosphere, the community's winding streets are lined with lush trees and surrounded by water. Thirteen miles of bike paths and sidewalks allow for enjoyment of outdoors. Lighthouse Point residents also benefit from excellent police and fire departments, a fully operational library, Dan Witt Park and Lighthouse Point Tennis Center for the sports enthusiasts. The historic Hillsboro Lighthouse stands sentinel over the inlet at Lighthouse Point. Bordered by both the intracoastal and the ocean, Lighthouse Point is home to gorgeous and manicured parks, making it ideal for joggers and bikers of all ages. 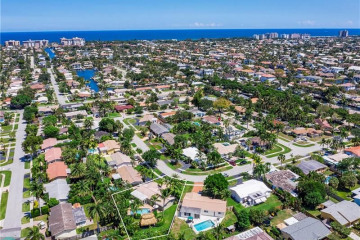 Nestled in between other communities in Fort Lauderdale, Lighthouse Point is a small town offering residents a peaceful atmosphere without the fear of future development. The majority of residences in Lighthouse Point are single family homes, which make up 80306f the property in the area and line the city's sprawling 18 miles of waterways and canals.